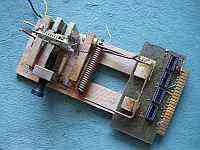 This page documents ideas for using commonly available materials in electronic and radio projects. The raw materials might be found in your local supermarket, DIY store or model shop, amongst other places. The only criteria is that they must be useful and they must be easily available locally in your town! There aren't 101 ideas here, of course. But I'll add more as time marches on, so it might start to approach 101 eventually. If you have any of your own to contribute, then please email them to me. 1. 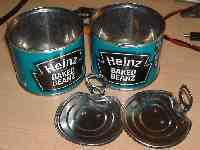 Baked Bean Cans for circuit boards, shields, etc. 2. 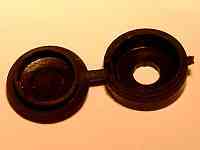 Screw covers for cabinet feet. 3. Aluminium angle for cabinet construction.